Is there any validity believing that a lack of vanillin says anything about the shroud’s age? Vanillin is not a separate component from lignin. In fact it’s not even a component of flax or linen. It’s a degradation product of lignin, derived from oxidation, side-chain shortening (loss of 2 carbons) and detachment starting with one particular monomer in the complex resinous polyphenol that is lignin, ie. coniferaldehye. See my earlier posting on the subject, this site. Ray Rogers no less described and discussed vanillin as though it were a preformed component of lignin that gradually reduced with age. Nope: as the lignin oxidizes, the vanillin is newly formed, and being a relatively small molecule, gradually evaporates away, being responsible for the distinctive aroma of old lignin (the ability to detect it by smell being a sure sign that molecules are escaping into the air). Anyway, if you haven’t read [Colin’s] earlier posting on the subject, you should. Do we really understand if the vanillin claim is valid? And if you want to know what in the weeds means, it is this: In golf, when a shot lands on the fairway, it’s in plain sight in easy-to-play short grass. 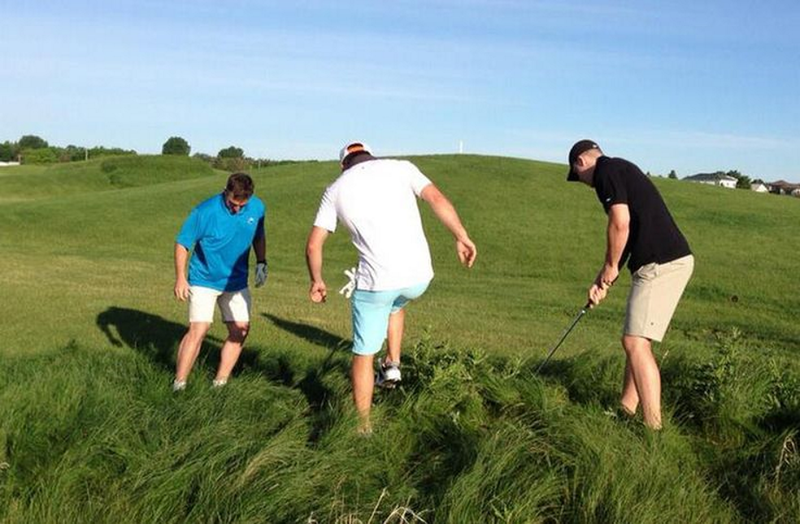 When a shot lands to the side, it’s in unkempt grass, and the golfer wastes time trying to find the lost ball. He’s literally "in the weeds". And Colin wants to know why Google and people don’t find what he writes about on his blog. There is a practical limit to topic drift. What does comments about vanillin have to do with Here’s an updated version of my ‘iconoplastic’ modelling of that Turin so-called “Shroud” (probably a misnomer)? Anyway, NOW, the topic is vanillin and the question is this: Is there any validity believing that a lack of vanillin says anything about the shroud’s age? What is the use of a clock that is either running, or has stopped completely? That is the situation with the Shroud linen. We are asked to believe that it’s the absence of Wiesner-reactive lignin that is the reason, ie that it is incredibly aged. Sorry, I don’t buy that. The “vanillin clock” is so poorly documented that I decline to believe that the absence of a positive test is necessarily to do with age. It could be due to any number of factors…. … someone decided to fumigate the reliquary (see my earlier comment). They removed the TS, then inserted a lit sulphur candle. Later the candle was removed, and the TS replaced, with its long sides folded in towards the middle before folding or rolling. Residual SO2 made better contact with the central regions of the TS than with the edges. So the reactive aldehyde groups of lignin in the initially peripheral Raes threads were better protected from the SO2 than the more central threads. I’m not suggesting this was the actual process that gave the difference between Raes v the rest, but it’s an indication of the uncertainties that attach to using a chemical as distinct from radioactive clock, where one is at the mercy of environmental conditions that one can only guess at, as I am guessing right now. I can do Topic drift too: Early in my career, I used to work with several gangs of bridge carpenters (some of our old bridges were still built in timber). They could pick up a chip of wood lying around, smell it, identify it, and give their verdict: ironbark, turpentine, totara, kahikatea, or whatever it might be, and they’d always be right. Of course flax isn’t timber, and they were probably picking up the smell of the residual gums and resins. Wouldn’t know if they could pick up vanillin, but some of our old Maori kuia used to weaving flax probably would. Yes, Dan, but it’s not because I’m adding new material unrelated to the blog title that is the problem where the increasingly law-unto-itself Google is concerned. One can enter the entire title of my latest posting into Google, and it will have a blind spot for my posting. Why? The answer is clear: it considers I have misspelt my neologism ‘iconoplstic’ believing i really meant to say ‘iconoclastic’ despite enclosing it inverted commas. It then proceeds to list returns with ‘iconoclastic’ scored out after each entry, i.e. apologizing so to speak for failing to find links that include ITS key word, not mine. This is bizarre and dare one say arrogant behaviour on the part of Google. As recent as yesterday it was failing to “find” my posting, but picking up secondary mentions, as the one on this site. Today, it’s finally found it, but displayed it against my name first instead of more user-friendly title. None of this nonsense happens when I post to my sciencebuzz site. Why is that? That has Google-owned Blogger Blogspot as host, and I suspect it’s one rule for those in the Google stable, a friendlier more ‘forgiving’ rule, and a different one for those on WordPress, present company excepted where other factors outweigh the second-class citizen treatment. The EU is currently taking a long hard look at Google’s abuse of its (constructive) monopoly, and not before time. Google needs a good hard kick up its derriere. I think the point about the vanillin is not how much there is in absolute terms, but the fact that Rogers claimed a difference in vanillin between his Raes fibres and his ‘main body’ fibres. If the two were really from different ages and provenance, then the difference could be significant. Unfortunately, as with most of Rogers’s later papers, it is not clear whether all his fibres were what he thought they were, or whether the same test was applied to the two differently sourced samples or what his comparison samples were, or how they were tested. Always use the instant “sniff test” on this website: Hmmmm…. Rogers or Berry, Rogers or Berry, “geez, no contest”. Nuff said. (For the weak of mind: It’s “Rogers” every time). “O-4-linked conyferyl and sinapyl aldehydes in ligniying cell walls are the main target of the Wiesner (phloroglucinol-HCl) reaction” vi è forse una traccia utile per i nostri dibattiti ? >In ogni caso mi pare che Berger non abbia dato un colpo decisivo alle questioni evidenziate dal chimico USA Rogers… Che ne pensate ? “O-4-linked conyferyl sinapyl and aldehydes in ligniying cell walls are the main target of the Wiesner (phloroglucinol-HCl) reaction” there is perhaps a trace useful for our debates? >In any case it seems to me that Berger did not give a decisive blow to the issues highlighted by the US chemical Rogers … What do you think? I think that ATR-FTIR can be interesting way. Actually it was an unconvinging answer to a question from Thibault Heimburger, who noted that Rogers used the Holland cloth as a control. That’s pretty accurately agenda-driven SO2. to test the Shroud only in an angle …. This cannot be the right way to solve the entire Enigma. AFM-Raman, etc.] proposal to investigate the issue…). Have you found other useful ideas?